Includes important weight and balance information related to types of aircraft, positioning of jacks, weighing the craft, and more. Explains the eight major helicopter types and how their systems operate. A practical guide to the repair of advanced composite structures. Newly revised to include the most up-to-date information on aircraft gas turbine powerplants and updated coverage of jet engine technology. Covers vital information for A&Ps, avionics technicians, flight engineers, and ATP applicants. A complete physics course for aviation-related trades. A key resource for A&P technicians, homebuilders, pilots, and aircraft owners. 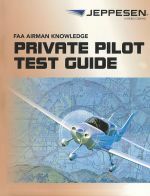 Supplement your studying with this test guide that comes loaded with all of the FAA recreational and private pilot airplane knowledge test questions, along with the correct answers, detailed explanations, and study references. Contains all the FAA instrument rating knowledge test questions along with the correct answers, explanations, and study references. Expect the 10001388-019 Edition released in August 2016. Contains all the FAA commercial pilot knowledge test questions along with the correct answers, explanations, and study references. Prepare for your private pilot airplane single-engine land (ASEL) practical test with this study essential. FAA handbook provides knowledge for earning the Aviation Maintenance Technician certificate, Powerplant section. This is the Jeppesen reprint. (FAA-H-8083-32). Contains the FAA Question Bank for both the Instrument Rating and Flight Instructor Instrument knowledge tests. A companion to Jeppesen Helicopter Maintenance, containing over 1,300 questions and answers. Create your own custom slide shows using the latest images from the Aviation Weather textbook. With this valuable CD, you can create impressive, custom slide shows using over 165 of the latest full-color images from the Private Pilot Manual. Presentation tool for flight instructors. With this valuable CD, you can create impressive, custom slide shows using over 165 of the latest full-color images from the Instrument Rating/Commercial Pilot Manual. Intuitive organization and colorful presentation make this manual an essential study aid on your journey to an instrument rating or commercial certificate. This syllabus provides a basic framework for your commercial and/or instrument training. This set of three exams provides a valuable tool for testing your comprehension of subjects covered in the Private Pilot Manual.